Prabhu Pingali is Professor and Director at Tata-Cornell Agriculture and Nutrition Initiative, Cornell University. Previously he was the Deputy Director of the Agriculture Development Program at the Bill and Melinda Gates Foundation and the Director of the Agricultural and Development Economics Division of the Food and Agriculture Organization (FAO) of the United Nations. 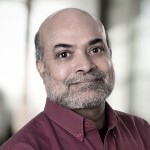 Prabhu was elected to the U.S. National Academy of Sciences as a Foreign Associate in May 2007, and he was elected Fellow of the American Agricultural Economics Association in 2006. He was the President of the International Association of Agricultural Economists (IAAE) from 2003-06. He was named the “2010 Outstanding Alumnus” of North Carolina State University. Prabhu has over twenty five years of experience in assessing the extent and impact of technical change in developing country agriculture in Asia, Africa and Latin America. An Indian national he earned a Ph.D. in Economics from North Carolina State University in 1982. He was Director of the Economics Program at CIMMYT, Mexico from 1996-2002. Prior to joining CIMMYT, he worked at the International Rice Research Institute at Los Baños, Philippines from 1987 to 1996 as an Agricultural Economist, and prior to that at the World Bank’s Agriculture and Rural Development Department from 1982-1987 as an economist. He was a visiting scholar at Stanford University, Food Research Institute, and an Affiliate professor at the University of the Philippines at Los Baños. Prabhu has authored ten books and over one hundred referred journal articles and book chapters on technological change, productivity growth and resource management issues in Asia, Africa and Latin America. He has received several international awards for his work, including two from the American Agricultural Economics Association: Quality of Research Discovery Award in 1988 and Outstanding Journal Article of the Year (Honorable Mention) in 1995.